Fight picks must be entered in this thread by July 16, 2014 no later than 9:00 pm East Coast Time... one of the Mods will update the 1st post to log each player's picks. Player's picks entered into the 1st post. ...and on the prediction show, I picked Leslie Smith to win by Decision over Jessamyn Duke. Don't forget to get your picks in guys. 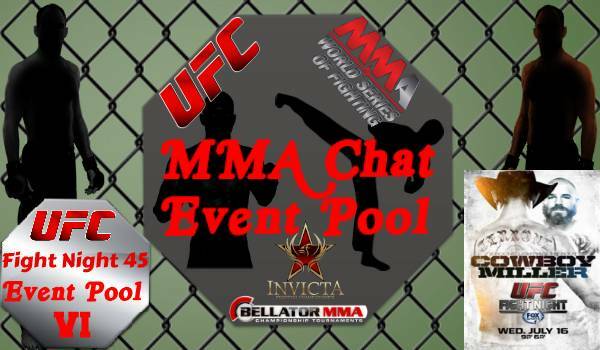 There's still over an hour and a half to get your picks in if you want to take part in this Event Pool. Smith just destroyed Duke... Duke has showed absolutely nothing to make anybody think she should be fighting in the UFC. Will the "Cute Factor" keep her from getting a pink slip after tonight ? 15 minutes left to get your picks in. Can't wait to see if Dunham can beat Barboza. I somehow missed this... I'll enter them now. Dude has some good striking. I'd agree. Good fight so far. Yeah it is... I thought White was actually gonna be the aggressor early on, but it was Martins. That might cost him the fight.